Each year we read tragic stories about journalists who are killed on the job. The recent series of attacks on women journalists, though, reflects new levels of violence and retribution that deserve special attention. Kim Wall, a Swedish freelancer who wrote for the New York Times and the Guardian, was brutally murdered in mid-August, allegedly by the submarine inventor she was interviewing for a feature story. Blogger Daphne Caruana Galizia, who led the Panama Papers investigation and exposed government corruption in Malta, was the victim of a car bombing on October 16. In September, American-born journalist Hala Barakat was murdered along with her mother, a Syrian activist, in Istanbul. Gauri Lankesh, an Indian journalist and critic of her country’s ruling party, was shot outside her home in September as well. Tatyana Felgenhauer, a journalist at Russia’s only independent radio station, barely survived being stabbed in the neck during a break-in at her studio on October 23. While all journalists are subject to human rights abuses, women face additional gender-related threats, harassment and violence. Some argue that journalism has grown too dangerous for women, which exacerbates the problem in very real ways. Escalating challenges to press freedom and women’s rights also are having an impact. What can we do to protect women journalists and ensure a diversity of voices in media? Let’s start with the data. Tracking journalist deaths can be complicated; the criteria used by monitoring organizations differ in how “journalist” is defined, whether accidental deaths are included along with targeted killings, and whether or not it can be proven that a journalist was killed due to their work product. To give an idea of scope, sources such as Committee to Protect Journalists and Press Emblem Campaign say that the number of journalists killed so far in 2017 is in the 50-85 range, and roughly 15 percent are women. The overall number of women journalists worldwide lags far behind men — only a quarter are women, according to the Global Media Monitoring Project, and the percent varies dramatically by country. Shared research methodologies would support even more accurate collection of data globally. Why, then, should we pay special attention to women journalists who die on the job? First is the especially brazen and gruesome nature of the killings this year. As friends of Kim Wall, who was a 2016 fellow for my organization, the International Women’s Media Foundation, we watched in horror as outlets reported the brutality of her murder near Copenhagen. After her car was bombed, Daphne Caruana Galizia’s body was hard to identify. These reporters are not on the fringe; both Carauna Galizia and India’s Gauri Lankesh were widely read in their countries. Targeting a citizen of the European Union is also unusual. It appears that perpetrators are feeling bolder than ever. The number of women journalists killed is on the rise as well. According to a 2016 report of UNESCO’s Intergovernmental Programme for the Development of Communication (IPDC), between 2006 and 2013, four women journalists were killed per year on average; in 2014/2015 it was nine. This year it’s 13, with two months to go (see Figure 1). The UN Secretary General has drawn attention to the fact that more women are being targeted and in an August report to the UN General Assembly, called for an increased focus on their safety. While all journalists are subject to human rights abuses, women face additional gender-related threats, harassment and violence. At IWMF’s Courage in Journalism Awards in October, a captivated audience watched footage of Kazakh journalist Saniya Toiken being arrested and detained by authorities that she had recorded on her mobile phone. Many women work in areas where women have few rights to begin with. The digital space offers new frontiers for harassment; soon the IWMF will embark on a study with Trollbusters and Craig Newmark Philanthropies to assess how online trolling affects women journalists. Whether digital or in-person, the abuse can prevent women from entering the field, prompt them to leave it, block survivors from seeking justice, and more. That the gender gap in journalism is alive and well may not be a huge surprise. Without diverse voices and viewpoints, though, our body of knowledge is neither rich nor complete. Their gender can also offer special opportunities for bringing us the truth. Courage winner and NPR foreign correspondent Deborah Amos described being able to travel more freely in Syria while wearing a hijab. 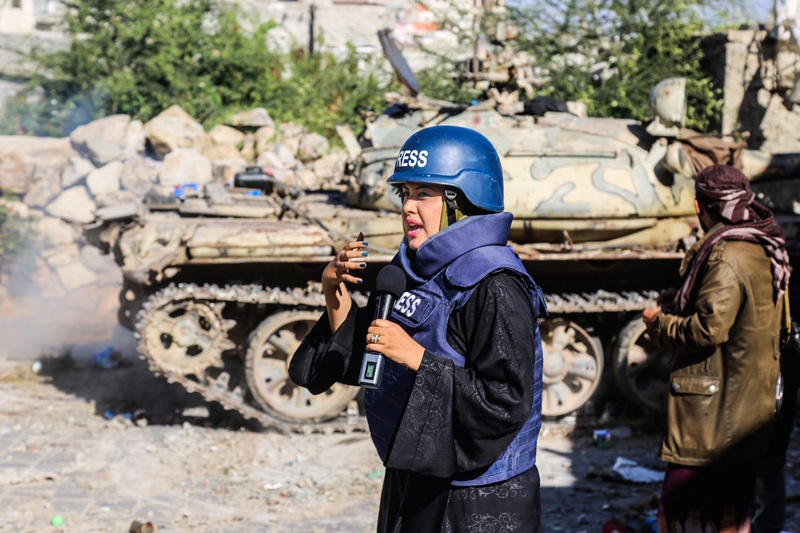 Hadeel al-Yamani, the first women TV correspondent for Al Jazeera Arabic in Yemen, spoke about interviewing families in spaces where men journalists are simply are not permitted. All shared their commitment to covering the human side of conflict, regardless of risk. Several dedicated their awards to the true heroes, the people in their stories. These themes have been repeated over and over again in the program’s 28 years. How do we keep women journalists safe? According to the IPDC report, the answer comes down to “three Ps”: prevention, protection, and prosecution. While the third P speaks to legal and judicial system failures that allow many perpetrators to go free, at the IWMF we have found we can help address the first two one-on-one, through hostile environment first aid trainings (HEFAT). 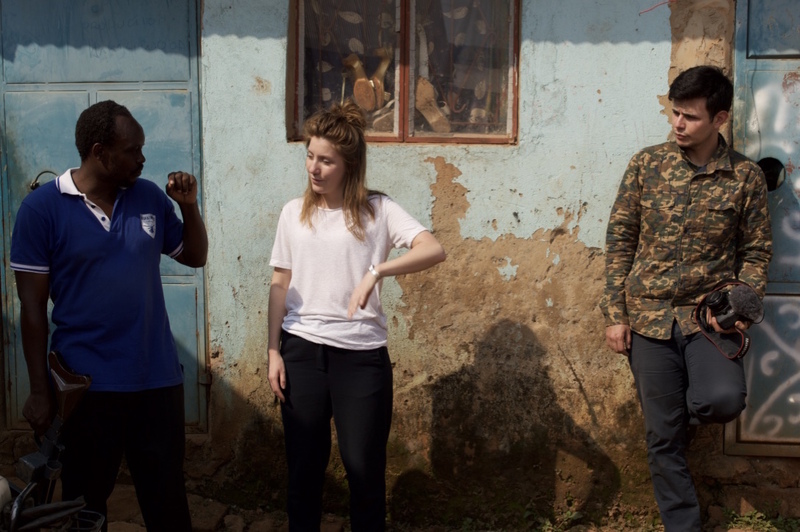 These trainings use realistic scenarios to equip women journalists — and men as well — to avoid dangerous situations, escape as needed, and treat injuries in real-time. One of the hundreds of journalists we’ve trained, photojournalist Adriane Ohanesian, recently told us that HEFAT saved her life in the Democratic Republic of Congo. HEFAT is especially critical for freelancers like Adriane, who news organizations are turning to more and more to produce content but who usually can’t afford the high HEFAT price-tag, relying instead on fellowships, grants, and other methods to do their work. The media community has grown more attuned to these risks since 2015, when a number of entities formed the ACOS (A Culture of Safety) Alliance and developed a set of Freelance Journalist Safety Principles that serve as standards for hiring, compensation, and support in the field. Over 60 outlets and NGOs, including the IWMF, have signed on. Grantmakers need to follow guidelines like these as well. All of these measures will support all journalists. However, we need to recognize that gender balance and safety are critical aspects of press freedom that need to be addressed explicitly. With women’s issues in the news and as attacks escalate, the time is now to acknowledge journalists who persist amid incredible challenges in bringing us the truth. And to equip more women to make vital contributions, safely. Elisa Lees Muñoz is Executive Director of the International Women’s Media Foundation.